Join Us in Celebrating National Voter Registration Day! LGBT Life Center is excited to once again participate in a national effort to engage and mobilize Americans in our political process by helping to register over a hundred thousand voters across the country on September 26, 2017, National Voter Registration Day. 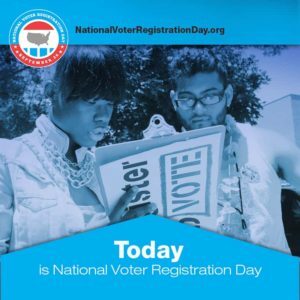 First held in 2012 for that year’s presidential election, National Voter Registration Day has become a 50-state holiday where thousands of organizations and volunteers organize to ensure our family, friends, and neighbors are registered to vote. Have you moved — even just across town — since the last election? Have you changed your name? Will you turn 18 by Election Day? Are you a newly naturalized citizen? Have you not voted in a while? In all of these cases you may need to register or update your voter registration in order to make your voice heard at the ballot box this November. Why register in 2017? Virginia has big elections this fall. National Voter Registration Day is the perfect opportunity to get involved no matter what party you support or which issues matter most to you.